I guess I'll tell you some more about it. 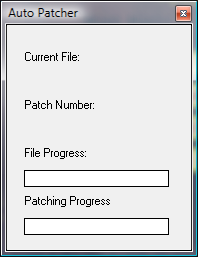 The autopather is relly simple; you put the files in an folder in the server, and you tell the server which files are in which patch and how many patches there are in Patches.ini and set AutoPatch to 1 in Data.ini. Then the client will deal with the rest itself. If you want to reset the patches to save space, just add the Patches.ini from client in a patch and set PatchTotal to 0 then you can delete all files from patch folder in server and reset Patches.ini server side. You'd have to add the Patches.ini in Patch 1 though.